Buy this item and earn 679 ClubPoints. 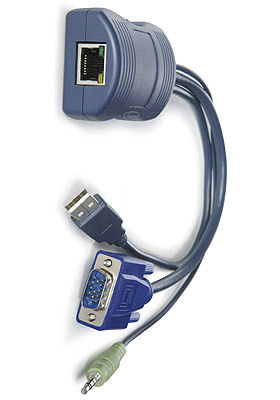 CATX-USBA/8: CATx USB/VGA/audio computer access modules (CAMs) "dongles"
AdderView CAT-X series computer access modules (CAMs) support a connection to a computer with VGA video and USB keyboard/mouse, and include support for speakers. Country code reporting, DDC and keyboard and mouse emulation ensure faultless operation. AdderView CAT-X series CAMs are Flash upgradeable, supporting CAT-x (x = 5, 5e, 6, 7) connection from the server to the switch, up to a distance of 160 feet.